The Society for the History of Authorship, Reading and Publishing (SHARP), a global network for book historians working in a broad range of scholarly disciplines, came to Sydney last week for its 2018 conference. Founded in 1992, SHARP hosts an annual event that brings together hundreds of scholars from across the world to share and discuss the latest research relating to book history. With more than a thousand members in over forty countries, SHARP works in concert with affiliated academic organizations around the world to support the study of book history in all its forms. On 7 July 2018, prior to the opening of SHARP’s 26th Conference, ACIAC hosted an international symposium titled ‘Chinese digital publishing and reading: Evolving models and emergent cultural practices’. 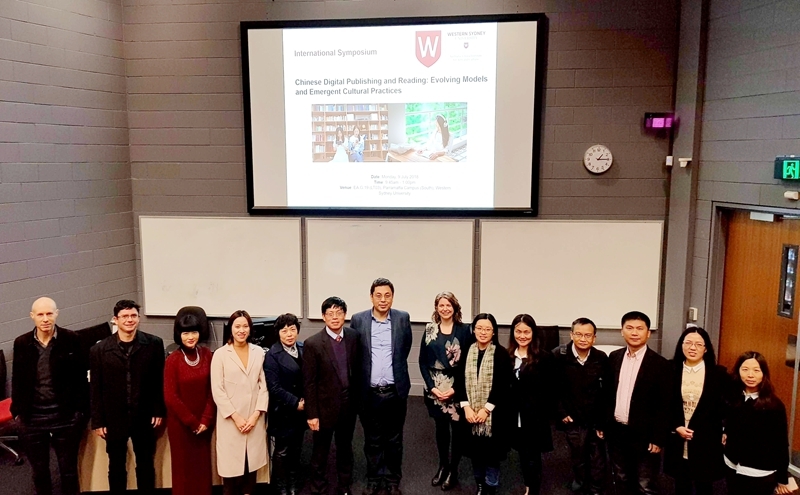 The event was co-convened by ACIAC Research Fellow Dr Xiang Ren and Professor Zhiqiang Zhang from Nanjing University, and attended by some 30 Chinese and Australian scholars and members of the SHARP Society. At this symposium, six quality papers were presented on various topics ranging from eBooks to audiobooks, App-based interactive books, online literature, and Paid Knowledge initiatives. The speakers included, apart from Professor Zhiqiang Zhang and Dr Xiang Ren, Associate Professor Lihua Zhao and Ms Pei Lin of the Communication University of China, Associate Professor Min Shen of Zhejiang Gongshang University, Associate Professor Yan Wu of Nanjing University and Elain Jing Zhao of the University of New South Wales. Professor Ned Rossiter and Dr Liam Magee of Western Sydney University and Dr Beth Driscoll of Melbourne University were the discussants whose comments ignited a lot of discussions on the future of publishing from global perspectives. This symposium was hosted against the background of the rapid growth and fast-paced innovation in China’s digital publishing sector. It was generally believed that the digital transformation of Chinese publishing went well beyond industrial or technological change because it profoundly shaped the ways Chinese people read and write, and raised significant issues worth exploring in an international context. The symposium certainly provided a forum that facilitated such transdisciplinary and intercultural conversation. The intercultural conversation on Chinese publishing continued in the major SHARP conference, in which Dr Xiang Ren is a member of local organising committee and scientific committee. Professor Zhiqiang Zhang delivered a keynote speech on the evolution of character layout in Chinese books from vertical and right-to-left arrangement to horizontal and left-to-right arrangement, along with a number of interesting presentations by Chinese scholars on publishing histories, literature and book culture. These papers significantly enriched the geographic, cultural and linguistic diversity of a very well-attended and successful SHARP conference in Australia this year.